On the second day of our vacation the roadtrip started for real. We had already driven 135 miles the previous day, but that was only go get us from the airport to our hotel and it was late in the evening so we didn’t see a thing along the way. We had originally planned to see a bit of Joshua Tree National Park, but because of the flight delay, that didn’t happen. 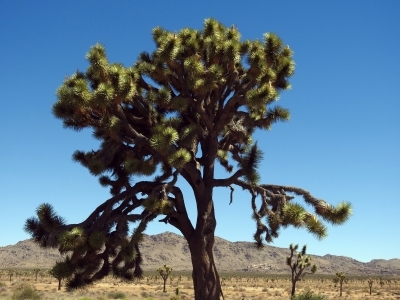 Therefore, we had decided that even though we had to drive quite a distance to today's goal, we would still like to take a look at the national park at least and therefore we chose to drive through the park to Interstate 10 southeast of Yucca Valley where we had spent the night. At 8:30 we left the hotel, even though we hadn’t gone to bed until around 1 am. When we left the hotel, the temperature was already well over 85, so we made our first stop at the nearest Walmart supermarket. Here we bought our "traditional" ice cooler, 32 bottles of water and ice for the cooler. I also bought some fruit for the trip. After the visit to Walmart we also went to a drug store to get some sunscreen. We added two bottles of cold water so we had something to drink while the water we bought in Walmart got cold. Then we headed into the national park at the entrance between the cities of Yucca Valley and Twentynine Palms. On the way through the park, we made some stops to take pictures of the landscape and joshua trees we passed. At a place called Hidden Valley, we made a longer stop and went for a walk in the area. We were at Hidden Valley around 10 o'clock, and at that time the temperature had reached 95 degrees and the sun was shining from a clear sky. We therefore started by putting on sunscreen, which we had bought in a drug store. As the hike took place in a somewhat hilly and rocky terrain, it took about half an hour to walk the 1,3-mile roundtrip, and we were pretty sweaty when we got back to the car. But we had seen a lot of interesting things along the way. Hidden Valley was originally a completely closed valley between the mountains that could only be entered with great difficulty, but a creative cattle rancher used dynamite to blow a path between some rocks for easier access to the valley. That way he made a great place for hiding stolen cattle, and the valley was used for this purpose several years. Today, it is a tourist attraction and the cattle are gone. When we got back to the car and had cooled down for a while, we continued the trip through the park. We stopped at several other places, for example at Cholla Cactus Garden, an area that, as the name suggests, has a large amount of cholla cacti, which is uncommonly devilish. If you just brush against one of these “bastards” you will immediately be pierced by lots of very sharp needles and signs in the area warned about this. The cacti actually look soft as though they are covered with hair, but is is actually razor sharp needles. Because of the soft appearance, they are also ironically known as "teddy bear cacti". In addition to warning against touching the cacti, there was also a sign that warned against "killer bees", but we didn’t meet any bees, killer or otherwise. In fact, killer bees are actually just African honey bees, that can be somewhat aggressive and often come in large numbers. Neither did we meet scorpions, tarantulas or other kinds of stinging or biting critters, and the only animals we saw were actually a few birds. The rest were presumably hiding in the shadow. We made one more stop, at Skull Rock, which is a rock that looks like a skull, but we didn't meet any bees here either. We continued the rest of the way through the park without any stops, except for a very short stop to change drivers just before we left the park. Tim had driven the first stint, and now it was my turn. We reached I-10 at Exit 163 that is 163 miles from the beginning of the interstate in Los Angeles. As you reach the Arizona state line shortly after Exit 243 when the interstate passes the Colorado River, we still had 80 miles to go to the border, which took us a little over an hour. From the state line, there were another 175 miles to today's goal in Gilbert outside Phoenix. Along the way we made a couple of stops, partly to get gasoline, and partly to get a cup of coffee. We reached Phoenix just during the rush hour, but despite of that, it was relatively easy as most people were heading out of town while we were heading in the other direction. Using our gps, we found our hotel in Gilbert, Doubletree by Hilton, without any problems. The hotel was quite close to the place where Tim's friend lives. She is known by the internet nick "Based Mama" (maybe because of her six, soon seven, children). However, when we entered the hotel they could not find our reservation and all the rooms were occupied. We had booked the room through Expedia, as we often do, and luckily printed the confirmation which I could show them. They started a major investigation into what had happened. In the end the hotel manager on duty actually called Expedia. Here it turned out that Expedia had canceled our reservation the day before, as they could not reserve an amount on $1 (one) as they always do. This was because that since we booked the room, my credit card had expired and a new one had been issued. So one missing dollar had caused our misery, which meant that the hotel had given our room to someone else. The staff, from the manager and down, were incredibly sorry and very helpful. They contacted another hotel in the neighborhood that they cooperated with, a Best Western, and here they had vacancies and we were very welcome. While we were waiting for all this, we were offered water and freshly baked cookies, although it was not really their fault. The Best Western was about 4 miles from the Doubletree, but still close enough to where Mama lived, and as Tim had a rather good idea of which way to go to the hotel from his previous visits to Gilbert, and the staff at the Doubletree also provided a detailed route plan., we didn't need the gps this time. At the Best Western they were also very helpful and in the end this hotel was cheaper so we saved a little over $100 on our two nights stay. So everything is well that ends well. If I ever visit Gilbert again, I will definitely book a room at the Best Western in the first place. When we had relaxed for about an hour in the room, we visited yet another Walmart as there was some things that we had forgotten in the first place. Among other things I bought some instant coffee so I could make my own coffee - at least in the hotels where there was kettle or coffee maker in the room. Then it was time for dinner and we once again (for the first time on this trip, as it was our first evening meal) visited an Applebee's, and as usual we had their "2 for 20" offer, including a starter to share and each a main course. The appetizer was the mandatory boneless chicken wings with hot buffalo sauce that we always eat, and for the main course we continued with chicken. We must save the planet by cutting down on the beef J (well, beef was on the menu later on the trip anyway). Tim got "chicken fingers" and I ate Mexican "fiesta chicken". Both were good as it is almost always the case at Applebee's. After dinner, Tim dropped me of at the hotel, and then continued to say hello to Mama and her family, especially the children, who were not all at home the next day where he should be with them all day. He was back at the hotel a little before midnight, so he could also be rested for the next day. Along the way on the 346 mile trip, we started our usual "game" of counting trucks from particular transport companies. In addition to the six companies we had been counting on previous trips, we added two new companies this year, namely Estes and Saia, but I will return to that when I get to the last article about this year's trip. The temperature reached 100 F, when it was at its highest but this would soon be exceeded – and then some.